The federal agency that processes applications for naturalization is forming a special group to track down those who lied or committed fraud to obtain U.S. citizenship. U.S. 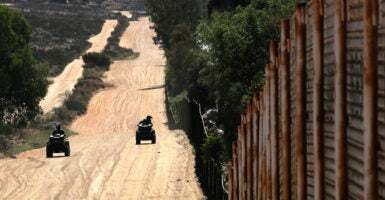 Citizenship and Immigration Services plans to hire several dozen lawyers and immigration specialists to review cases of illegal aliens who were ordered deported but used fake identities to get green cards and ultimately become American citizens, The Associated Press reported Monday. The USCIS group will refer fraud cases to the Justice Department, which will then initiate civil denaturalization lawsuits and, in some cases, criminal charges for fraud. The new office will be based in Los Angeles and plans to be operational by next year, Cissna said. Under Attorney General Jeff Sessions, the Justice Department has prioritized high-profile denaturalization cases against people who lied to immigration officials while applying for citizenship. Prosecutors in February filed a civil complaint to strip U.S. citizenship from the winner of a Diversity Visa Lottery who lied about illegally funneling cash to a subject of U.S. sanctions during his naturalization interviews. Later that month, federal attorneys filed similar actions against five convicted child molesters who lied about their criminal histories during the naturalization process. More recently, federal judges in April revoked the citizenship of a Somali immigrant who obtained green cards for herself and fake family members, as well as a Egyptian-born man who provided logistical support and recruited for the terrorist group al-Qaeda. Both cases were investigated by the Office of Immigration Litigation, a group within the Justice Department’s Civil Division. Denaturalization cases are relatively rare, but there is evidence that hundreds of illegal immigrants have avoided deportation by assuming false identities and then becoming U.S. citizens. A 2016 report from the Department of Homeland Security’s independent watchdog found the government mistakenly granted citizenship to at least 850 immigrants who had pending deportation orders. Will Racke is a reporter for The Daily Caller News Foundation.